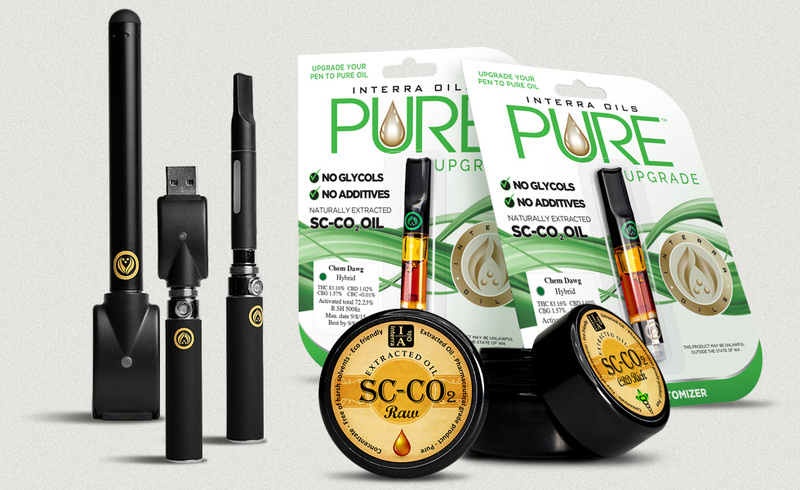 Interra Oils is the ORIGINAL trailblazer in today’s ever-evolving medical and recreational cannabis market. Together we discovered that the movement for a natural and clean medical cannabis product was in demand, although not exactly common in the marketplace. At the time in 2012, there wasn’t a single PURE oil atomizer available in the medical marijuana market. We at Interra Oils believe that a medical product should not be cut with various chemicals but rather as close to natural as possible. What resulted was a plan to begin producing hash oil via a CO2 extraction process and offer a refined PURE oil in an atomizer. Because there wasn’t a single PURE oil atomizer available to consumers, we named our first flagship product PURE Upgrade, with the tagline “Upgrade your pen to PURE oil!” Since that day in 2012, we have continued to be ORIGINAL through the evolution of our technologies, processes and product offerings to include PURE Upgrade GOLD, PURE FRACTAL, and Interra Ice in the atomizer category. All of these products, made with old world methods that stay true to strain are all manufactured with the same high standards as PURE Upgrade. Today our processes yield a top-of-the-line hash oil product sold throughout the state of Washington. In early 2015 we completed the licensing process for the recreational market, and we quickly launched sales in this new market category.